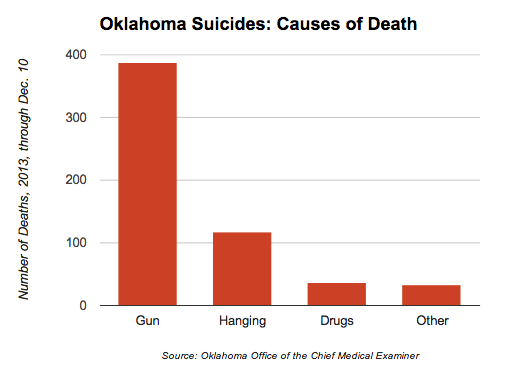 On most days in Oklahoma, one to six people kill themselves. In 2013, at least 617 people committed suicide in the state, far more than homicides. Homicides get all of the headlines and news footage. Suicides take place invisibly, cloaked in shame, fear of intruding on privacy, fear of inspiring others to take their own lives. Mental-health experts, however, call out for more attention to be paid to the problem, especially in a state with one of the nation’s highest suicide rates. 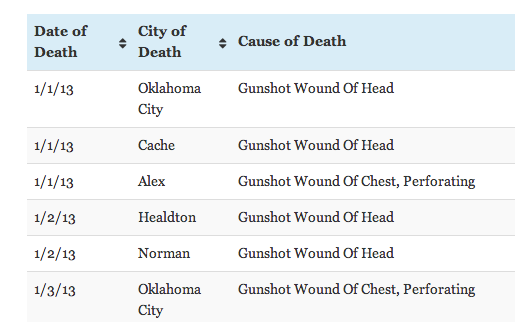 Oklahoma Watch invites you to look through a list below of 2013 suicides recorded by the Oklahoma Office of the Chief Medical Examiner. It’s a reminder of the constant, often only privately acknowledged loss of lives. People who know of someone who might be considering suicide should click here for advice. Those who are suicidal or deeply depressed should click here. Below the table is an analysis of the data. 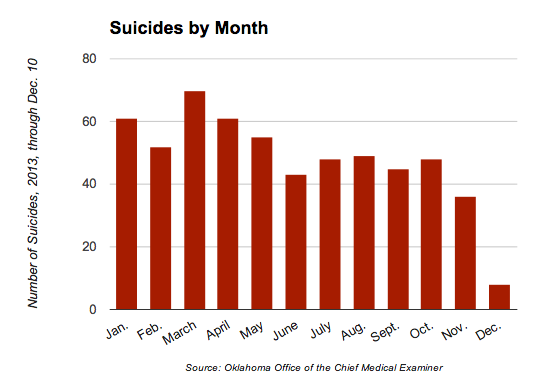 Total suicides, as reported by the Oklahoma Office of the Chief Medical Examiner. Click on column headings to re-order. Search by cause, city or date. 6/17/13 Hobart Contact Gunshot Wound Of Forehead, Penetrating. 10/13/13 Claremore Perforating Gunshot Wounds Of Head And Left Wrist. In 2013, through Dec. 10, more than two-thirds of suicides were committed using firearms. Suicides tend to be highest not during the late-year holiday times as many people believe, but in the spring. This year, with Oklahoma numbers through a third of the month, December was on track to be among the least deadly months of the year.